Comindware Tracker is a cloud-hosted workflow management platform that automates and optimizes business processes. With this, users can easily roll out custom workflows, create personalized forms, and even consolidate data effortlessly. The software also has a simple drag-and-drop interface, making it easy for both novice and professional users to navigate the software as soon as it’s installed. Comindware Tracker is a non-coding workflow software solution for business process modeling and management, automation of business operations, and workflow productivity boost. You can reduce dependency on IT and allow non-technical users to design, run, and modify workflows with drag-and-drop simplicity. 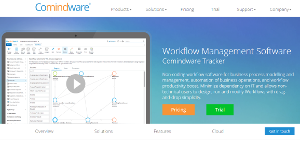 With Comindware Tracker, you can design, run, and modify workflows. Create web forms and gather necessary information during workflow execution. Automate business operations and increase workflow speed and transparency. Get extended reports and notifications. Plus, you can collaborate on workflows and tasks with your team directly from your Outlook. Get rid of unstructured group emails and chats, and ensure full traceability of the business context. You can design and set up workflows using the intuitive web-based user interface of the visual workflow builder. The app offers a quick workflow setup via Excel-like forms and business rules as well as a drag-and-drop workflow editor. Plus, you can make use of flexible business rules to set custom conditions for tasks, approvals, and task closures. Make use of any number of process steps, both as sequential and parallel. The user-friendly workflow builder can be easily set up and maintained by business users. You can easily design and configure web forms with specific data fields and layouts in the graphical UI with drag-and-drop simplicity. Features include configurable tabs and data fields, data export to MS Word and MS Excel, and on-the-fly changes to forms. Customized web forms for workflow allow gathering information from users during the execution of a workflow, e.g. for approval, order or change request. You can have a robust, automated workflow up and running within days, not months. Features include transition and validation rules for automated workflows, time- and condition-based notifications and assignment rules, and automatic modification of form fields depending on the workflow step or form data. The cloud-based Workflow Automation tool is designed to increase workflow speed, transparency, and team productivity by unifying tasks, documents, resources, and people in a single environment. You can collaborate on tasks and workflows with your team directly from your Outlook. Features include synchronization between Outlook and workflow management software lists of tasks, processes behind Outlook workflow tasks in progress\deferred status with play\pause buttons, collaborative thread, files versioning, and hierarchy of tasks and subtasks. You can combine your email and workflow apps into Outlook to create a robust solution where employees can conveniently manage their workload from their email. This also makes it easy to track and report on requests and approvals. Get full visibility and real-time control with the web-based workflow tracking tool that provides for execution and control of group task flows. Features include business analytics, fully configurable dashboards, notifications and reporting, and support for mobile platforms to enable you to execute your workflows on the go. Comindware Tracker offers transparency of task flows thanks to extended reporting and notifications as well as workflow analysis and coordination features, and helps to achieve full control of daily activities and workflow management. You can unify employees, knowledge, and automated processes in a single work environment and improve your team efficiency and performance. Features include searchable and actionable group discussions, document and knowledge sharing in work context, smart task routing and notifications, and OOB integration with Outlook, Active Directory, and SharePoint. Comindware workflow system offers a full set of collaboration tools – from information exchange to workarounds, from workflow management to easier task tracking – and maximizes the benefits of social networking, minus the distractions and risks of conventional social media platforms. You can set the business rules used to guide the path of the workflow and modify them on-the-fly. Features include execution and control of group task flows, and business rules enabling mandatory info capture and enhanced exceptions handling. Workflow tools and execution parameters including ‘by time’, ‘by trigger’ and others can be set in the user interface. The comprehensive Workflow Engine along with ongoing maintenance service and system upgrades is an ideal choice for businesses that expect to change business rules and modify workflows frequently. These include quick workflow setup without IT resources, on-the-fly workflow modifications, excellent employee adoption thanks to the Outlook-style interface, sophisticated workflow analytics and reporting, social collaboration capabilities, and cloud or on-premises deployment. If you are considering Comindware Tracker it may also be a good idea to examine other subcategories of Best Business Process Management Software collected in our base of SaaS software reviews. There are well-liked and widely used applications in each software category. But are they necessarily the best fit for your organization’s special needs? A trendy software application may have thousands of users, but does it present what you require? For this reason, do not blindly invest in popular systems. Read at least a few Comindware Tracker reviews and mull over the elements that you wish to have in the software such as the cost, main tools, available integrations etc. Then, shortlist a few solutions that fit your needs. Check out the free trials of these products, read online reviews, get information from the seller, and do your investigation meticulously. This in-depth research is certain to aid you select the finest software platform for your firm’s specific wants. How Much Does Comindware Tracker Cost? We realize that when you make a decision to buy Workflow Management Software it’s important not only to see how experts evaluate it in their reviews, but also to find out if the real people and companies that buy it are actually satisfied with the product. That’s why we’ve created our behavior-based Customer Satisfaction Algorithm™ that gathers customer reviews, comments and Comindware Tracker reviews across a wide range of social media sites. The data is then presented in an easy to digest form showing how many people had positive and negative experience with Comindware Tracker. With that information at hand you should be equipped to make an informed buying decision that you won’t regret. What are Comindware Tracker pricing details? What integrations are available for Comindware Tracker? Pros: Incredible agility is gives. Comindware Tracker delivers powerful web-based designers for workflow and form creation. It it turns that a workflow can be inproved or your form need an additional field, that is a matter of minuted to apply all necessary changes. Cons: Training might be better. Now you have to rely on the user guide and support team help. Pros: It helps to manage simple, yet important processes. You can set up something like 3-step process and make it more complex, when you know how to optimise it - really easy and effective. Cons: I don't like how attached files work. Browser offers to download them instead of view. That's something that can be easily fixed..